My assignment from Get It Scrapped! : Make a page that's a tribute to one of your friends. 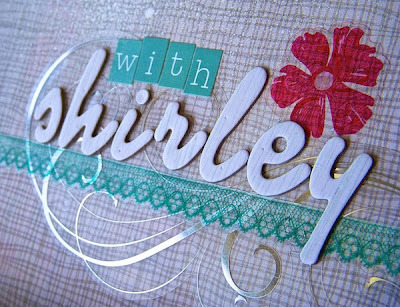 This page is about my friend Shirley. The photos of us trying on silly hats served as the starting point for a whimsical page. Playful layering and organic shapes supports a free-spirited tone. I wrote the first sentence and decided to follow the same format for a brief but meaningful list, which also gave me an appropriate title. You can see how the rest of the Design Team recorded their treasured friendships using photos, words, color and motif to bring their stories to life. The rest of the article is right here. We can get so caught up in scrapping about our family, but how about paying tribute to a special friend? This is very different to your usual style. I love it. 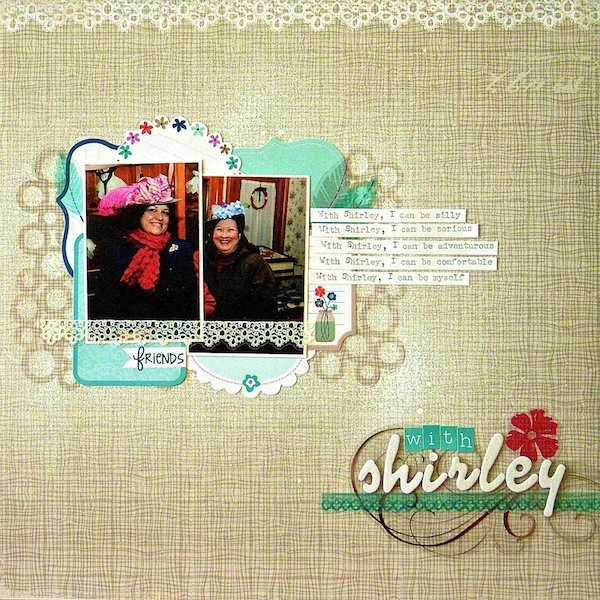 Such a gorgeous page, Sue! I love how the neutral background really shows off the photos. There is a lot of detail here and it isn't overwhelming. In fact, how did you do these designs? Are they from the Silhouette? So pretty! Lovely layout! I love allthe little journal spots tucked around the photo, fabulous design!! Absolutely gorgeous! Now you make me want to run out and get this LYB collection! You used it perfectly! Sweet page. Love the journaling. Cute photos you Ladies, Sue! Love the misted bubble mask in the background and great use of the LYB!